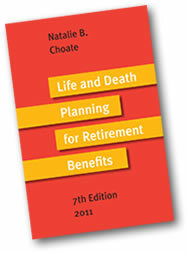 Home / Life and Death Planning for Retirement Benefits / Get CE credits for reading Natalie Choate’s book! Attention financial planners: Beacon Hill Financial Educators has received approval for its self-study test (in this case for CFP credits) based on Life and Death Planning for Retirement Benefits (7th ed. 2011). At their website www.bhfe.com you can buy the book and sign up for the self-study test to qualify for credits for a combined price of $189.